Identifying the geographic location that our ancestors first arrived to this new land can often separate a number of brick walls. It is helpful to draw maps that are "to scale". By this I mean tracing a map out of a recognized source to scale. The following is an example of my own family search, where the name "Jones Point" occurs. My ancestors arrived to stay in Virginia around 1650. [They were thrown out of England after Charles I lost his head.] 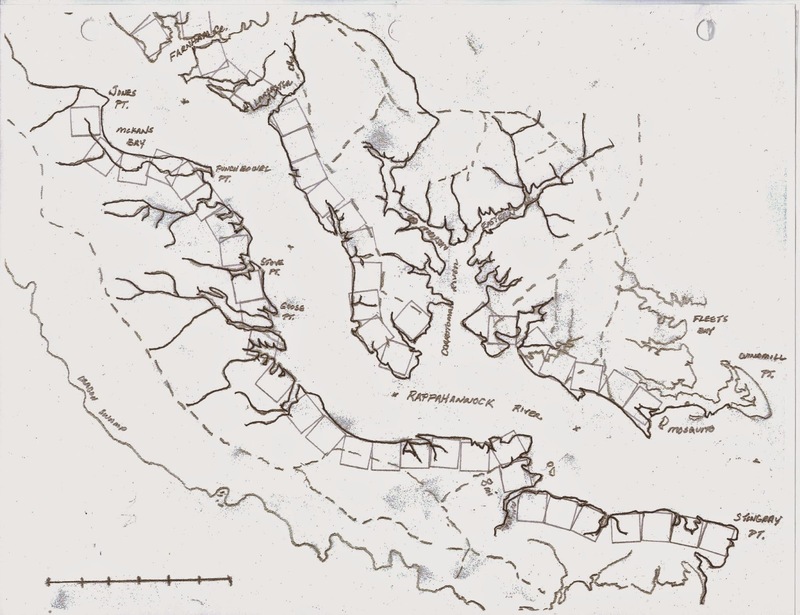 Rappahannock River was the major highway to their settlement. Where this "Jones Point" was located was one task, as well as, trying to determine if these JONES families were connected to my own family tree. As outline in the last post, landmarks are an important indicator of the families initial location. Tracing a map from the "mouth" [opening/starting point] using an identifiable scale [mile markers drawn] can be used to carefully locate positions along the coast line. Following the pathway along the shore line will give the location of other creeks, points, cliffs, etc., while providing a scale in which to mark the "mile markers" that often expressed in land patents. It is important to recognize that one "shore line" does not always match the same distance on the opposite shore. Each square above is draw as "mile markers" from the starting points [Stingray Point (south side) and Mosquito Point (north side) ] Eight miles up river on the south side is only four miles on the north side. The bends and curves of the river will also change their course moving "east to west" and then "north to south". Drawing maps to scale will help sort out these descriptors on land patents.